t in 1980. The University is also among the eight universities shortlisted by the National Universities Commission (NUC) in the “A “category. oth undergraduate and postgraduate programs. In the last decade, the University has focused its efforts on developing science programs in Engineering, Medicine, and, recently, Agriculture. University faculties include Faculty of Agriculture; Faculty of Arts & Islamic Studies; Faculty of Sciences and Faculty of Social sciences. BUK in the last few years has also created new degree programs, institutes, and departments. BUK has 24 affiliate programs with local institutions in Nigeria. The institution is also affiliated with the Association of Commonwealth Universities (ACU) and the Federation of the Universities of the Islamic World (FUIW). It is also among the few universities chosen by the World Bank as a Center of Excellence in Dryland Agriculture. 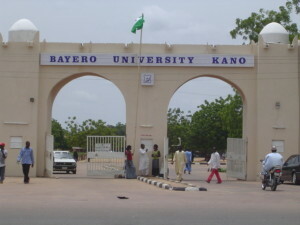 Bayero University Kano (BUK) has a number of notable alumni, some of which include the Governor of Kano State, Abdullahi Umar Ganduje; Former Governor of Niger State, Mu’azu Babangida Aliyu; several Senators and Members of the Nigerian House of Representatives.